Pew Research Center has released its State of the News Media report for 2015. There are few surprises. Traditional or “legacy” media (newspapers, magazines) continue to struggle financially. One surprise was that viewership of Cable TV news was down 8 percent while the audience for Network TV news grew by 5 percent. Another trend was that those who listen to podcasts has almost doubled since 2008 from 9 to 17 percent in 2015. I am reprinting the Pew report here for those who follow media trends–something writers and authors should do because we are inextricably linked. Call it a mobile majority. At the start of 2015, 39 of the top 50 digital news websites have more traffic to their sites and associated applications coming from mobile devices than from desktop computers, according to Pew Research Center’s analysis of comScore data. At the same time, though, desktop visitors to these sites tend to spend more time per visit than do mobile visitors. For half of these top 50 news sites – which include legacy print, cable, network, international and public broadcasting outlets as well as digital-only entities – visitors from desktops stay longer than those coming through mobile. The reverse is true for only 10 of the sites, while for 15 sites the time spent is roughly equal. In tandem with the growth of mobile has been the further rise of the social Web, where the flow of information embodies a whole new dynamic. Some of our 2014 research revealed that nearly half of Web-using adults report getting news about politics and government in the past week on Facebook, a platform where influence is driven to a strong degree by friends and algorithms. Americans’ changing news habits have a tremendous impact on how and to what extent our country functions within an informed society. So too does the state of the organizations producing the news and making it available to citizens day in and day out. Pew Research Center’s State of the News Media report focuses primarily on the latter, tracking the expanding and diversifying news industry over time and across a variety of indicators. Understanding the industry in turn allows researchers to ask and answer important questions about the relationship between information and democracy – whether this means exploring the degree to which like-minded consumers gravitate to the same sources, the opportunities consumers have or don’t have to stay on top of the activities of their elected officials, or how connected residents feel to their local communities. Even as mobile and social news habits evolve, legacy platforms have by no means been abandoned, though some are faring better than others. Local TV continues to capture broadcast viewers, with slight increases for evening (3%) and morning (2%) newscasts and larger ones for early morning and midday in 2014. Network television news saw a second straight year of audience growth (5% in evening and 2% in morning), for a combined average evening viewership of roughly 24 million. Cable news, on the other hand, had another rough year, with prime-time median viewership down 8% across the three channels – Fox News, MSNBC and CNN. Fox News fared the best, but still saw a 1% decline year over year. And newspapers, after an unusual year of small gains in 2013, saw both daily and Sunday circulation fall another 3% in 2014, declines that were felt across papers of all sizes. Newspaper weekday circulation has now fallen 19% since 2004. Digital and mobile developments have also broadened the world of audio. Podcast listening is on the rise, which could breathe new life into audio journalism. NPR’s podcast downloads alone grew 41% year over year, according to the company’s internal data. The percentage listening to online radio via mobile devices continues to rise, while the percentage listening on a desktop is falling. That means online radio listening can occur nearly anywhere – including inside cars, a traditional stronghold for AM/FM radio. As of January 2015, 35% of cellphone-owning adults have listened to online radio in the car, up from 21% in 2013 and nearly six times that of 2010 (6%). Whether this ends up a positive or negative development for news remains unclear. Hispanic-oriented news media, meanwhile, are struggling with the complexity of trying to reach a population that is both growing and becoming more native-born, with greater usage of the English language. Print circulation declined at the three long-standing Hispanic daily papers, and Univision, the leading Hispanic-oriented television network, saw audience declines for its signature national news programs after record highs in 2013. At the same time, a handful of English-language, Hispanic-oriented news websites such as Latin Post are trying to find a place in the market. These are some of the findings of Pew Research Center’s 2015 State of the News Media Report, now in its 12th year. This year we have created 13 data-filled fact sheets, each of which paints the portrait of one segment of the industry – from cable TV to African-American media to news magazines. Researchers have aggregated and analyzed data from nearly 20 different sources across 10 different segments of the industry. Each individual fact sheet, which will be updated annually, contains embeddable graphics that also link to full, annual data. This overview highlights and weaves together trends across the industry. Financially, the newspaper industry continues to be hard-hit. Newspaper ad revenue declined another 4% year over year, to $19.9 billion – less than half of what it was a decade ago. The slight 1% growth in circulation revenue among publicly traded newspaper companies that make their data public suggests that gains there are far from making up for advertising losses. Alongside those declines, three different companies in 2014 spun off more than 100 newspaper properties, in large part so that their still-robust broadcast or digital divisions would not be affected by the newspaper industry’s continuing financial woes. In contrast, local TV grew its on-air ad revenue to roughly equal that of newspaper ad revenue – $19.7 billion in 2014, according to BIA/Kelsey. That is up 7% from 2013 and 2% from 2010, the latter of which is perhaps more comparable to 2014 as it is the next most recent nonpresidential election year. News-producing stations, about two-thirds of all local TV stations, account for a disproportionate amount of this revenue. Retransmission fees, also on the rise, added another roughly $5 billion for the year, SNL Kagan estimates. At the network level, ABC and CBS revenue grew while that of NBC declined. ABC Evening News revenues, based on data from Kantar Media, have now nearly caught up to NBC’s. In cable, the NBCUniversal property MSNBC also fared worst. Its total revenue was down 1% for the year, due mainly to a 5% decline in ad revenue, according to projections from SNL Kagan. CNN’s revenue was projected to rise 3%, while Fox News revenue was projected to rise 6%, and was the only one of the three channels to report an increase in profit (10%). Subscriber revenue for all three was expected to see continued growth. For all of these legacy news sectors, significant digital revenues remain largely on the wish list. None get more than a small share of their total revenue from digital, even though digital ad revenue across all media grew 18% in 2014 to $50.7 billion, according to eMarketer. Mobile ad spending alone increased 78%, though that is a slowdown from the two years prior. Mobile ad spending now accounts for 37% of all digital ad spending, up from 25% in 2013. While new relationships have been struck between news organizations and tech companies like Facebook, the tech companies still control more of the arrangement and reap most of the financial benefit. Facebook now pulls in roughly a quarter (24%) of all display ad revenue and more than a third (37%) of mobile display. There is no organized method as yet for tracking the growing digital-only segment of the news media. In the 2014 report, we made a first effort through intense reporting to put a number on these ventures and the newsroom jobs and revenue associated with them. Over the past year, several of those that garnered attention for staff hires and journalistic investments had bumpy rides, revealing the financial and journalistic challenges that exist even for news outlets with a digital-first approach. First Look Media, which launched in January 2014 with an infusion of $50 million from eBay founder Pierre Omidyar, closed one of its signature news products, The Racket, before publishing a single story after star Editor-in-Chief Matt Taibbi walked out in October 2014, citing conflicts with management. Another key hire, former Los Angeles Times journalist Ken Silverstein, resigned from First Look’s investigative outlet, The Intercept, in early 2015, also attributing his departure to management style. The tech journalism outlet Gigaom, funded with over $20 million in venture capital including $8 million in 2014, shut down on March 9, 2015, with no warning even to staff when it found itself unable to pay its creditors. BuzzFeed built up its investigative and foreign teams over the past year but also had to deal with ethical questions surrounding the removal of posts that spoke negatively of key advertisers. And The New Republic – not digital-native by any means, but purchased by Facebook co-founder Chris Hughes in 2012 with the mission of re-creating it for the digital era – faced mass resignation from newsroom employees who clashed with the direction in which CEO Guy Vidra, formerly of Yahoo, planned to take the publication. At the same time, though, several others took journalistic strides. Vice News, launched in March 2014, cites 1.1 million subscribers and 175 million video views as of early 2015, and Pew Research Center’s analysis of comScore data finds more than 15 million unique visitors to its main website, Vice.com, as well as associated apps in the month of January. Its journalistic accomplishments included the first interview with the architect of the CIA detention program, James Mitchell, which drew 350,000 video views in the first four days of its posting, according to shared internal data and, in March 2015, an interview with President Barack Obama. Vox.com, the news site of Vox Media launched in April 2014 under the leadership of former Washington Post journalist Ezra Klein, met its revenue goals and surpassed its traffic goals in its first six months, according to co-founder Melissa Bell. And in January 2015, it had almost 14 million unique visitors, according to Pew Research analysis of comScore data, ranking it 35th in the top 50 news sites. The company overall is valued at $380 million. Politico, launched in 2007 by two former Washington Post reporters as a news outlet for Washington politics, announced plans to open bureaus in Florida and New Jersey and possibly other states, and it launched Brussels-based Politico Europe in April 2015. Business-oriented Quartz, a 3-year-old venture owned by Atlantic Media, announced in March 2015 that it will expand its reporting staff into Africa. At the local and state level, digital nonprofit journalism continues to develop and, according to Pew Research Center’s study on local news ecosystems, can help provide a kind of second tier of news. Yet the staffing capacity and financial maturity across these outlets varies dramatically. The Texas Tribune, for example, has more than 40 staff members with a 2013 budget of more than $7 million, according to a recent Knight Foundation report, and through new grant money in 2014 began staffing a Washington bureau. The New Orleans-based investigative outfit The Lens, on the other hand, scaled back its reporting after unanticipated funding shortfalls. On the for-profit side, Billy Penn, the Philadelphia-focused, mobile-first news site launched by former editor-in-chief of Digital First Media Jim Brady in late 2014, reported more than 100,000 page views in February 2015. Up to this point, though, while the site is for-profit in name, it is still largely funded by Brady himself. Overall, digital news entrants and experimentation, whether from longtime providers or new, are on the one hand now so numerous and varied that they are difficult to keep track of. On the other hand, the pace of technological evolution and the multiplicity of choices – from platforms to devices to pathways – show no sign of slowing down. With each new pathway or platform, the old ones continue to be used, posing a nearly unattainable challenge to an industry in financial difficulty. And if news in the social space is moreincidental and driven to a large degree by friends and algorithms, then gaining a foothold there may be even more elusive – or at least less in the industry’s own hands – than a secure financial model. The State of the News Media 2015 is the twelfth edition of an annual report by the Pew Research Center’s Journalism Project examining the landscape of American journalism. This year’s study includes 13 data-filled fact sheets, each of which provides the latest audience, economic, news investment and ownership trends for key sectors of news media, from cable TV to African-American media to news magazines. This study also includes a searchable Media & News Indicators database. 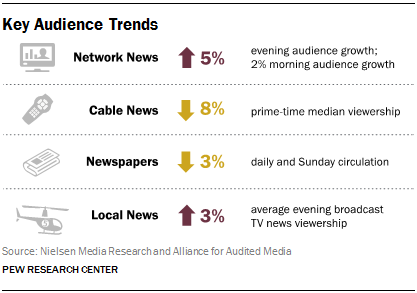 2 Newspapers continue to struggle as an industry, but cable news also saw a significant decline. Combined median prime-time viewership for CNN, Fox News, and MSNBC was down 8% in 2014, according to Nielsen Media Research. Despite the audience drop, revenues were up 4%, according to SNL Kagan. Meanwhile, newspapers saw circulation decline by 3%, according to our analysis of Alliance for Audited Media data, and a BIA/Kelsey estimate showed advertising revenue was down 4%. Ad revenue is now less than half of what it was a decade ago and daily circulation is down 19% over that same period. 4 One area with new momentum: podcasting. NPR reports that downloads of their podcasts were up 41% in 2014. The percentage of Americans who have listened to a podcast in the past month has almost doubled since 2008, from 9% to 17% by January 2015, according to Edison Research. And one-third of Americans ages 12 and over have ever listened to a podcast, up from 11% in 2006. 5 Financially, the legacy news industry has made little progress in securing more of the digital dollar. Digital ad revenue across all media grew another 18% in 2014 from 2013, to over $50 billion, but traditional news outlets get relatively little of that pie. Instead, five technology companies took in half of all display ad revenue, with Facebook alone accounting for 24%.